Having just added a porch onto her home, Miranda of Live Free Creative Co. was excited to get festive for fall. 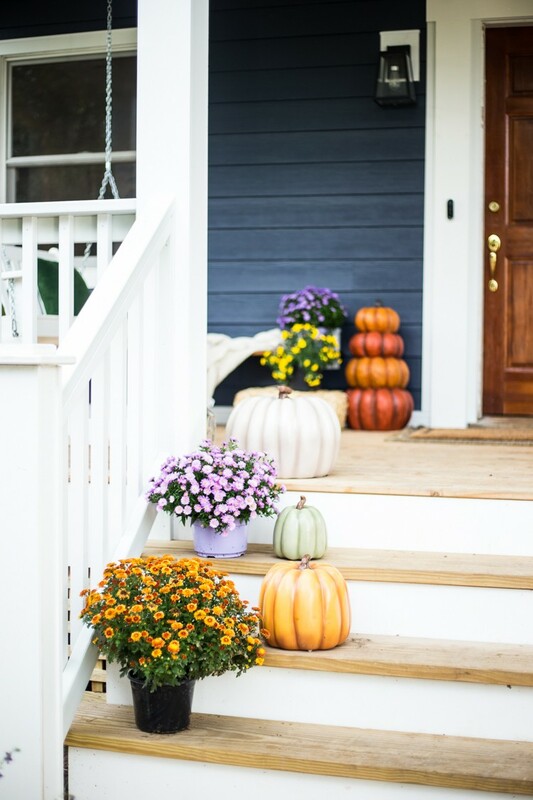 Follow along as she shares three easy tips for decorating your porch for fall. We recently added a front porch to our small cape cod style home in Virginia. In addition to being a fantastic outdoor living space, and our favorite hang-out spot, it also is SO FUN TO DECORATE! 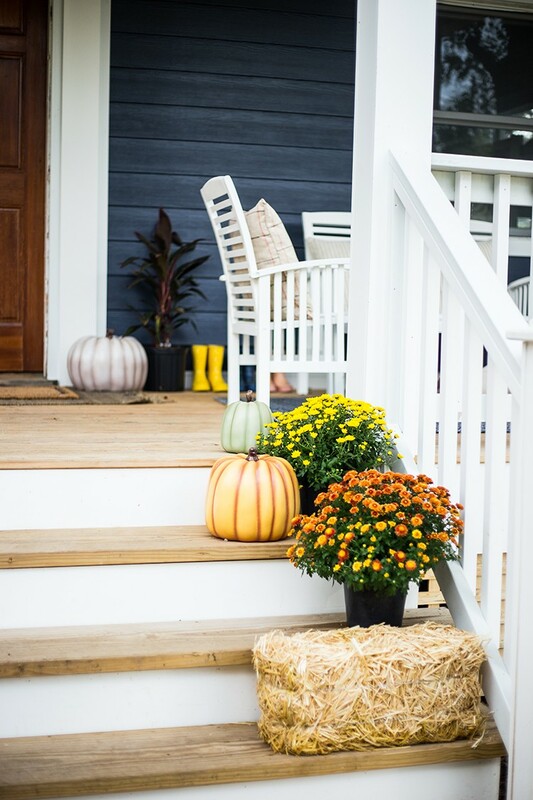 As we approach the fall season, I want to share my Top 3 Tips for Easy Fall Porch Decorating, because it can be easy to be super overwhelmed with all of the options. Choosing a decor theme allows you to stay focused and buy, make, or collect items that all have a similar feel and vibe. The more cohesive the decorations are, the more you will enjoy them! I like to stick to natural feeling decorations, and in the fall flowers, pumpkins, and hay bales feel perfect. Normally, I buy fresh pumpkins every year and then throw them away when they rot. 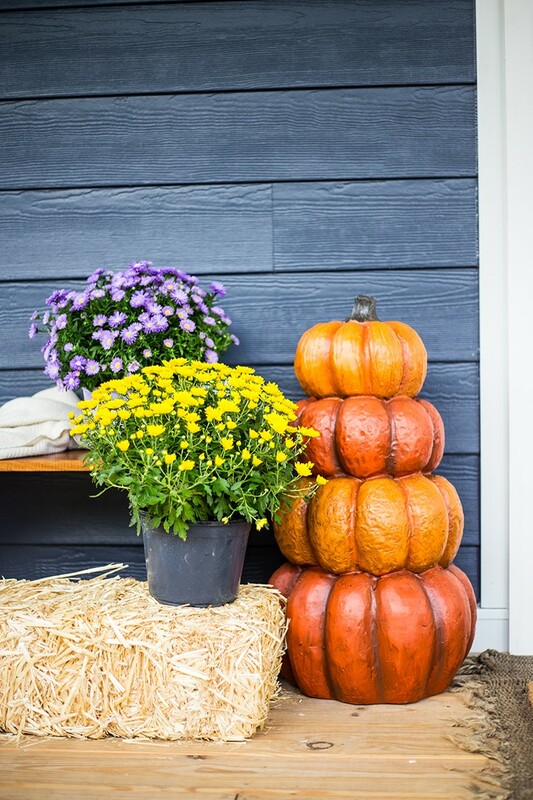 I am so excited to have found this amazing Harvest Pumpkin Stack and these Stackable Pumpkins at Home Depot that can be used year after year. The two varieties give nice color variation, and I love both the tall stack near the door and the other sets that can separate into individual pumpkins. The hay bales add levels, fill in the spaces, and are a nice place to stack other decor. And I love all types of seasonal plants as decor. These mums come in so many colors and sizes, they add to the Harvest theme perfectly! I stuck with yellow, orange, and purple as my colors for the flowers, and then the hay and pumpkins reflect similar hues so the whole porch feels pulled together. Especially in the fall, there is not only the overall SEASON of autumn to celebrate, but we also have Halloween and Thanksgiving within the season itself! One way to be able to easily make sure your decorations fit the holiday and the season is to start with a base layer of simple decorations for the fall, like these harvest style items. They can go up in September and stick around until the end of November! Then, as Halloween approaches, layer on some more spooky decorations more specific to the holiday. I’ll be adding a skeleton to the porch swing, spider webs and spiders in the hay bales and mums, and (if my kids talk me into it) a fire breathing dragon to the lawn. After Halloween, the spooky decor can be stored away, and you can layer on some more Thanksgiving specific decor, if you want. A basket of apples, faux turkey, or some autumn leaves will play nicely with the base harvest decor. While the porch itself is fun, I love using the stairs and sidewalk leading to the house as a preview of the festivities. 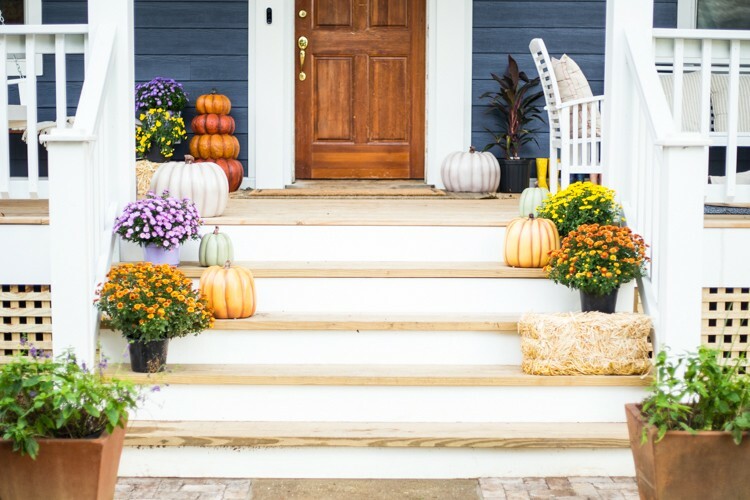 If your porch has stairs, they are a natural place to stack plants, pumpkins, or other fall decor. If you don’t have stairs, consider the sides of your walkway as added space for your decorations to live and tie into the porch itself. 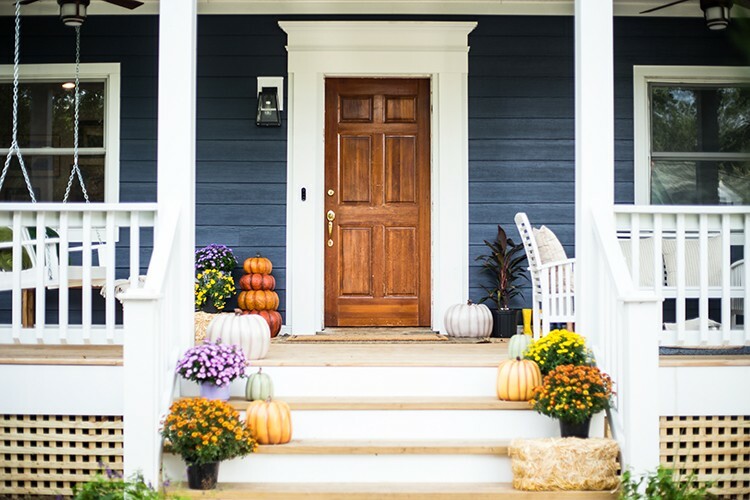 Also, if you don’t have a porch at all, think of your entrance area as the porch and add fun fall decorations to wherever there is a little bit of space that could use some thoughtful design and celebration this fall season! 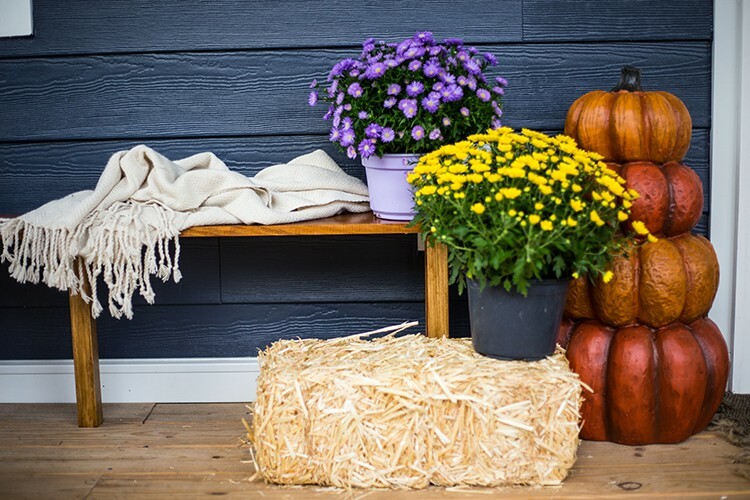 The post 3 Tips for Easy Fall Porch Decorating appeared first on The Home Depot Blog.